A few questions about this recipe: In a recent class your recipe called for use lemon juice rather than the chicken/veggie stock listed here. What’s the difference? Also, can I leave out the cinnamon, as I have a few dishes that already include cinnamon? 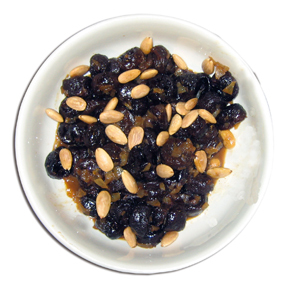 Hi Lois, it is fine to make the prunes according to how you like them. In the original recipe I learned the woman used chicken stock and a little orange juice which made it a meat dish and gave it a nice savory/sweet flavor. I have since developed a version that replaces the liquid of the chicken stock with orange juice or water and lemon juice that can be served for vegetarian/parve meals, and has more of a sweet/tart flavor. (You can also replace the chicken stock with vegetable stock.) Either way is delicious! And you can leave the cinnamon out if you think that you have too many dishes with cinnamon, but it does add a nice flavor that balances the prunes.